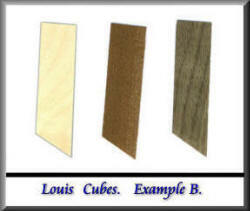 Louis cubes, as mentioned and described above, are a clever arrangement of three pieces of veneer which when done as Alf will describe to you, will give you a surprisingly effective 3-D illusion that you can use for furniture or picture frame decoration. 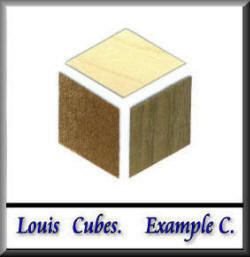 The Louis cubes are very effective when used for decorating small boxes. I have also seen a superb use made of Louis cubes in decorating the covers of a large book, and also a "treasure chest" style of lidded container/box. The only problem with Louis cubes is that they become so addictive that you start using them to decorate everything in your house that has a flat and blank surface! 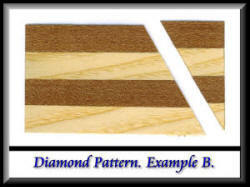 With the template in position cut one strip approximately 7 or 8 inches in length (178 x 204 mm) from each piece of veneer (as shown below in example A). Place the piece of veneer against the 60° angle and with the template in position along the bottom edge then make the first cut (example B). The first cut piece which will be a small triangle can be thrown away. 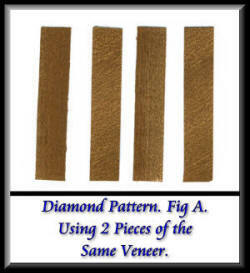 Slide the veneer down until it touches the lip on the board and with the template in position make the next cut so that you now have a diamond shape, and so on to the end of the strip so that you have a series of veneer diamonds, do exactly the same with the other two veneers, you should now have a number of pieces (example C). Tape the pieces together to form the cube. 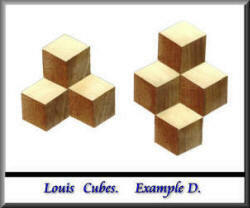 If you have assembled them correctly your Louis cubes should look like those cubes shown in example D. You can go on adding more cubes ad infinitum until you have sufficient for your project. 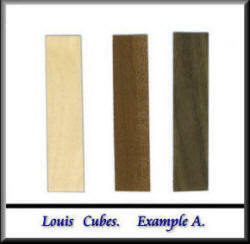 It's not too important which veneers you choose for your Louis cubes. The most important points are that they should be contrasting veneers and, although this isn't too crucial, that they should be reasonably easy cutting veneers that don't splinter readily, otherwise you'll have to tape the reverse side of the veneer to prevent splitting and breaking. 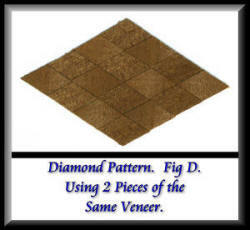 These diamond patterns follow the same sort of cutting arrangements as you would have used with cutting the pieces for your Louise cubes. 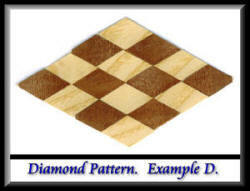 The arrangement of the diamond pieces is different to the Louise cubes in that the grain pattern is used in a more linear fashion rather than the juxtaposition style of the Louise cubes. 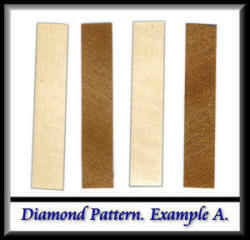 The effect is more subtle with the diamond patterns, but is very attractive none the less. Method: Cut with the grain 4 strips of your selected veneer using the template, the strips need to be 7 or 8 inches (178 x 204 mm) long. For the second veneer, place the protractor along the base of the veneer and mark off 60° against the grain, cut this angle and mark off another 4 strips as above by placing the veneer against the angle on the cutting board and using the template. 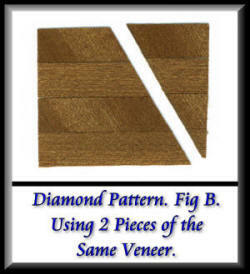 Join the strips together, once again place the protractor along the base of the veneers and mark and cut off (example B). Place the angle against the angle on the cutting board, and with the template cut a number of strips (example C). By moving each strip one place, we now have our pattern (example D). 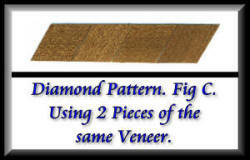 The same procedure applies with the use of 2 consecutive veneers. 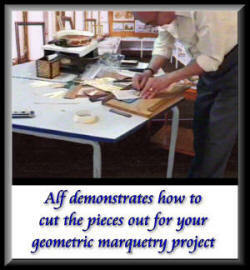 Well we hope you have found these geometric tutorials and demonstrations of Alf's interesting and informative. These geometric designs make wonderfully attractive decoration for the borders of marquetry pictures, or indeed, any pictures. Boxes in particular, and most furniture, look extremely nice when decorated with any of these designs, although in many cases it is often better to limit the amount you apply of these designs, it is often better to err on the side of the subtle rather than the too obvious. Alf will be back with further demonstrations in future updates to this web site. In particular Alf has an excellent demonstration on the use of the piercing saw currently in preparation. You will certainly not want to miss that tutorial. 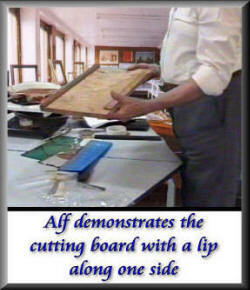 Thanks for the tutorials and demonstrations you have been doing for us Alf, it's very much appreciated by us all.